Actions allow you to set up automatic functions to be performed after a page is successfully completed, or if specific conditions have been met in the survey. For example, you could setup an action to automatically add the responders to a “Sign Up for My Newsletter” survey to the Contacts section of your account, or you could setup an action to automatically email any responses received. While in the Content step of a survey, click the down arrow icon next to a page’s name, and select Actions. 2. Select an action type: Add a contact, Send a campaign, Send notification email, Redirect to page, Redirect to URL. 3. Configure the action, and click the Update button when complete. 4.Click the Save button on the survey to ensure your changes are applied to the live survey. 1. Click the down arrow icon next to a page’s name, and select Actions. 2. Then click the down arrow icon next to the action you wish to modify or remove, and select Edit or Delete. Click the Close text link to close the window, and then click the Save button on the survey to ensure your changes are applied. Click the radio button next to the Add a Contact option. Enter a title for the action, such as “Store contact details”. Click the Select Groups text link to choose the group(s) the contact details should be stored in, and/or click the Add Group text link in the window that appears to add a new group(s). Click the Select button when all groups have been selected. Choose how any duplicate contacts should be handled (Append, Leave, Update or Replace). The Action 'Update' is recommended and the most commonly used. Map the survey questions to specific fields in the Contacts section of your account. 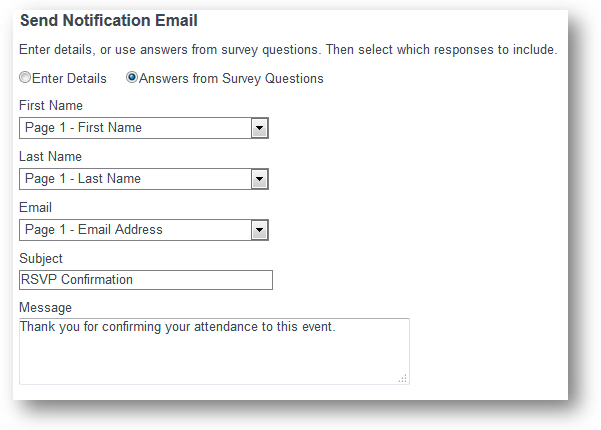 Note at least one survey question must be mapped to the Email field, as that is the unique identifier for all contact records in your account. Specify when the action should be triggered. 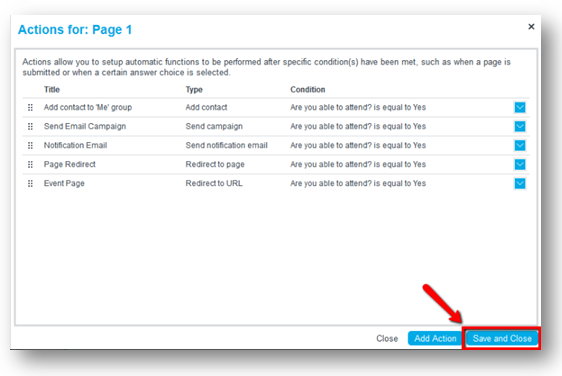 The default condition is upon page completion, but you could set specific condition(s) so that the action is only triggered when a certain answer choice is selected. Once all selections have been completed, click the Update button. Click the radio button next to the Send a Campaign option. Enter a title for the action, such as “Send welcome email”. Click the Select Campaign text link to choose the campaign that should be sent to responders. A list of your campaigns will open in a new window. Please Note: only Sent campaigns will show in this list. Our system does not allow you to link In Progress campaigns to a survey action, because if that campaign is them deleted the action will break. If you want to link a campaign to a survey Send Campaign action, you must first create that campaign and send it to yourself as a live campaign. Choose your campaign from the provided list and Select. You also have the option to add responders to a group within the Send Campaign action. If you would like to do this, click the Select Groups text link to choose the group(s) the contact details should be stored in, and/or click the Add Group text link in the window that appears to add a new group(s). Click the Select button when all groups have been selected. Choose how any duplicate contacts should be handled (Append, Leave, Update or Replace). Once again, the Action 'Update' is recommended and the most commonly used. Click the radio button next to the Send a Notification email option. Enter a title for the action, such as "Send notice email to team". Enter a first and last name for the recipient of the notification email. Then select the survey questions and responses that should be included in the notification email. Click the radio button next to the Redirect to Page option. Enter a title for the action, such as “Move respondent to Afternoon Session page”. Select a page from the drop down menu to redirect responders to once this page is successfully completed. Click the radio button next to the Redirect to URL option. Enter a title for the action, such as “Launch landing page”. Enter the web address or URL that responders should be redirected to once this page is successfully completed. Use this action to define a callback URL to which we will HTTP GET/POST information as actions take place on surveys. This option needs to be switched on by our support team for use. Click the radio button next to the Web Hook option.